A curious thing happened to me the other day. I was standing in a two-hour line waiting to check out of a going-out-of-business sale. Needless to say, women were getting anxious and itchy waiting and determining if their treasures were really worth the wait. A faint tinkling suggested itself to our sense of hearing, and then a full throttle cacophony of chimes heralded the deposit of 70 percent off wind chimes. The atmosphere immediately changed. Diminished was the stress of waiting to take our sale items home. Some bargain hunters even abandoned their place in line to select a set of wind chimes and went to the back of the line! Such is the soothing power of music on the mind. Throughout history, wind chimes and gongs have played an important role in Eastern religions and music. They have been used to scare off evil spirits and attract good karma. Buddhist temples are adorned in chimes and bells for meditation and spirituality. In the practice of Feng Shui that literally means wind and water, wind chimes are used to boost positive energy, harmony and balance. Chi is the movement of energy and it is believed that a positive flow of chi brings health, happiness and good fortune. 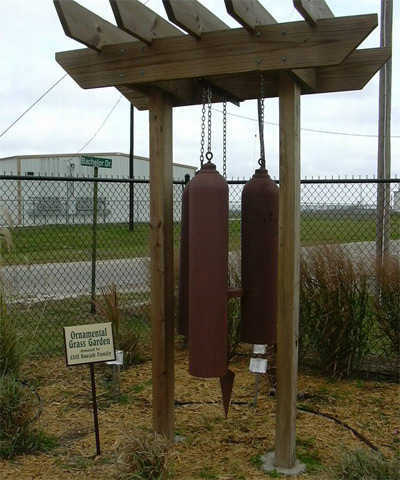 Three old oxygen cylinders, approximately four feet in length, were converted into different size gongs and refurbished to hang together to provide music for Victoria Educational Gardens. Look for them in the ornamental grass section. In the past, before radar and satellites, wind chimes also played a role in primitive weather forecasting: predicting the approach and strength of a storm. They may still be used to observe weather changes depending upon where they are placed. If a wind chime is placed on the north side of a house, only a north wind will move it. If we cannot control the Nor’Easter, at least we can hear it coming. My favorite part of the Master Gardeners’ Victoria Educational Gardens (VEG) has always been the sensory garden. Previously, I was well aware of the visual, tactile, olfactory, and of course, gustatory benefits of gardening. But the auditory aspect of gardening still tickles my fancy. I love the sound of rushing or falling water, not to mention the birdsong and the rustle of the trees. The addition of phase two of our VEG brought the spirit of gardening carried by the wind. On a field trip to the gardens of the Fort Bend County Master Gardeners, we visited their Japanese garden. Their massive cast iron gong, naturally aged to a rich patina, resonated with deep, haunting sounds. The idea was planted. Plans were made. The site was selected. The search for the gong was on. John Morris, owner of Morris Underground Construction was able to locate three 150 cubic ft. oxygen cylinders that are approximately 4 feet long. Using welding knowledge, he removed the valves from the top to release any trapped oxygen, then sawed off the bottoms of the tanks. The oxidized metal was painted and the gongs were hung in the ornamental grass garden, donated by the family of Master Gardener, Cliff Knezek. Gongs have a deep, soothing and healing connection to our soul. The deeply earthy, relaxing sounds of the gong are amplified as they travel on the prevailing winds at the Victoria County Airport. The longer lasting softer tone due to the large outside diameter of our gong has a sustained resonance that goes on for a remarkably long time. Like voices in a choir, wind chimes sing together. The tone, timbre or voice of a wind chime is determined by the material from which a wind chime is made, as well as the thickness of the cylinder walls and how it is hung. The length of the column determines the pitch of the sound: the smaller the wind chime, the higher the pitch; the larger the chime, the lower the pitch. Wind chimes may be tuned to various musical harmonies; for example, one wind chime plays the opening notes of “Amazing Grace”. The soothing sounds of ceramic, stained glass, seashells send the spirit of the garden on symphonic breezes. The earthy tones of bamboo, gourds and or terra cotta chimes lend tranquility to the landscape setting. Magical music is made by metals like aluminum, brass, or copper pipes; or even horseshoes or mechanics’ tools when played by the wind. The tinkling of recycled keys, old silverware, glass beer bottles or metal cans or even old CDs tickle the fancy of fine connoisseurs of yard art. The type of wind chime is limited only by imagination. Wind chimes can be made from detailed instructions found online or purchased from our local garden centers and nurseries. John Fossati of Four Seasons Garden Center admits that wind chimes are the most popular gardening gift item sold for the Christmas season. Be chiming this season and give the gift of music to a garden. The Gardeners' Dirt is written by members of the Victoria County Master Gardener Association, an educational outreach of Texas Cooperative Extension-Victoria County. Mail your questions in care of the Advocate, P.O. Box 1518, Victoria, Texas 77901; or vcmga@vicad.com, or comment on this column at www.VictoriaAdvocate.com.